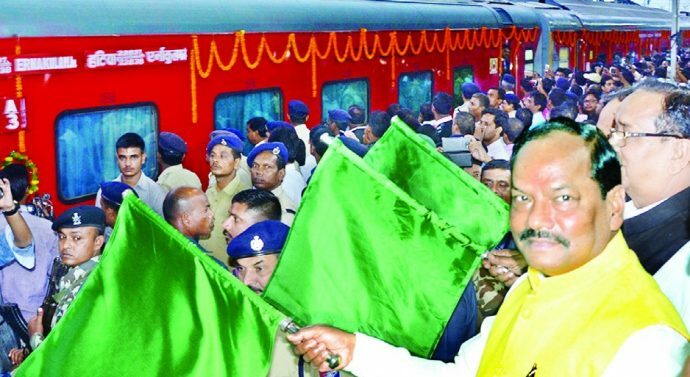 Ranchi, Oct. 27: Chief Minister Raghubar Das today requested the Railway Ministry to change the name of Hatia Ernakulam Express train to Bhagwan Birsa Munda Express while asking it to ensure fast completion of its projects in Jharkhand. “It will help the South Indian people know about the great martyr Bhagwan Birsa Munda. It will also help local people including patients to go to Vellore for treatment without facing much difficulty,” the CM said while addressing a gathering on the inauguration of a weekly train service from Hatia to Ernakulam on Thursday. The CM said that from Railway’s revenue point of view, Jharkhand is the second largest state in India. No sooner than the iron ore transportation starts, it will be the largest revenue generating state in the nation. He said that new bogies should be added to the trains of Jharkhand. Das said that Rs. 8400 crore railway project is running in the state and it should be completed at the earliest. The state government has given its contribution to the Railways. Most of the work of Ranchi-Barkakana-Hazaribag- Koderma (203 km) is complete and trains will run soon on this route. Ranchi-Lohardaga-Tori and Koderma-Tilaiyya project are also near about complete. Giridih-Koderma work is complete. Dumka–Rampur Haat scheme is finished while the Pirpaiti-Jasidih scheme (Rs 2100 crore) is at the MoU stage. The CM requested to speed up work of railway over bridge construction at places including Birsa Chowk, Jugsalai and other ROBs. He also demanded to include Dhanbad in the smart railway station’s list and run train from Ranchi to Jamshedpur. He appealed to people to keep the station neat and clean. MPs Ram Tahal Choudhary and Mahesh Poddar, MLA Navin Jaiswal, South East Railway GM Ashish Kumar Goyal and DRM Anshal Gupta were present on this occasion.